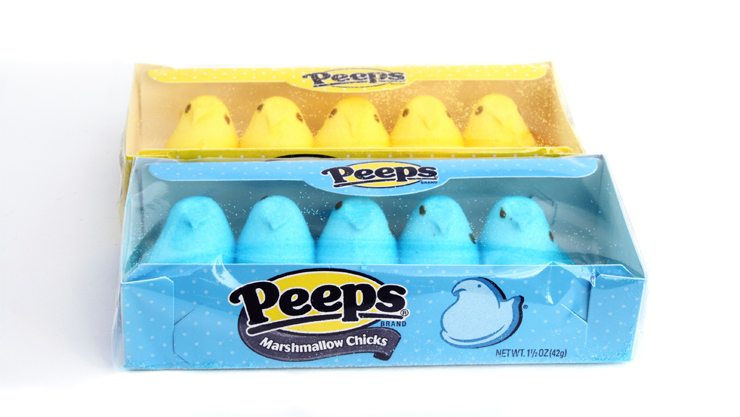 Now that Easter is approaching there will be plenty of Marshmallow Peeps® available to enjoy! While it’s certainly fun to eat Peeps® by themselves, there’s so much more you can do with them! Here’s a cheesecake recipe to try. Preheat the oven to 350 degrees Fahrenheit. Spray a 9-inch springform pan with cooking spray. Melt butter in the microwave or in a small saucepan. Add graham cracker crumbs, 3 tablespoons of the sugar, and melted butter to a medium-sized bowl and stir until well combined. Press the mixture onto the bottom of the springform pan. Place the pan in the center of the oven and bake for ten minutes. Remove the pan from the oven and set aside, but leave the oven on. Using a pair of kitchen scissors, cut each of the Peeps® into ¼ inch pieces and set aside. Make sure the cream cheese has been left out long enough to bring it to room temperature. Place it in a bowl with 1 ½ cups of the granulated sugar and beat on medium speed using an electric mixer until smooth. Set the mixer on low speed and slowly add the vanilla extract, milk, and sour cream while the mixer is running and blend until smooth. Add the eggs one at a time and blend until all the ingredients are well combined. Using a sturdy rubber spatula, fold the Peeps® into the cream cheese mixture until all the pieces are fully incorporated throughout the batter. Carefully pour the mixture into the springform pan. Place the pan in the center of the heated oven and bake for 60 minutes. Turn the oven off but leave the cheesecake in the oven. Crack the oven about 1-2 inches to let some of the heat escape. Let the cheesecake cool in the oven for about 5 hours before transferring it to the refrigerator. Remove the cheesecake from the springform pan just before serving. Serve each slice with a dollop of whipped cream and give each slice its own Marshmallow Peep®, if desired. Flavored Cheesecake. You can easily change the flavors of this cheesecake by using different flavors of Marshmallow Peeps®. For instance, if you would like a strawberry flavored cheesecake, simply use strawberry flavored Peeps®! Chocolate Cheesecake. Follow the recipe listed above, but select the original flavored Peeps® instead of some of the other flavors. Use chocolate graham cracker crumbs when making the crust. Add ¼ cup unsweetened cocoa powder to the cream cheese mixture after adding the eggs. Vanilla Cheesecake. Follow the recipe listed above, but select the original flavored Peeps® instead of some of the other flavors. Add 2 tablespoons of vanilla extract to the cream cheese mixture instead of 1 tablespoon. Use vanilla flavored whipped cream to garnish the cheesecake just before serving.